These Pumpkin Spice Waffles are crispy on the outside, tender on the inside, and filled with cozy fall flavors. 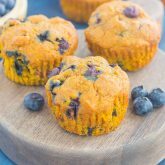 You can satisfy your craving for pumpkin with this easy breakfast that’s sure to be a favorite all year long! I’ve made pumpkin pie oatmeal, pumpkin nutella muffins, and even pumpkin spice granola. But, you know what I haven’t made for breakfast yet? Waffles! And french toast, but that’s for another time. In fact, it’s been way too long since I’ve made waffles, but there’s a reason for that. See, I’m not really the best waffle preparer, if that makes sense. I can make a delicious batter, but I often lose patience when waiting for the waffles to cook in the waffle maker, resulting in either under-cooked (and overflowing out of the maker), to the extreme of being too crispy. I know what you’re thinking…most waffle irons come with a light that tells when it’s cooked, and even comes with a handy dandy little batter scooper to ensure that you’re using just the right amount to get those nice, round waffles. Well, I’m here to tell you that my waffle iron is exactly like that, with a dial to select your preferred crispness, a light to signal when it’s cooked, and a little measuring cup. Yet, I still fail in getting my waffles to be slightly crisp and round. But after numerous tries, I finally perfected these Pumpkin Spice Waffles. Sure, the batter was oozing out of my waffle maker (maybe you remember my snapchat of that), I burned a few to a crisp, and under-cooked a few that stuck to the iron. But after several attempts and making the batter and working on my waffle skills, I got it! 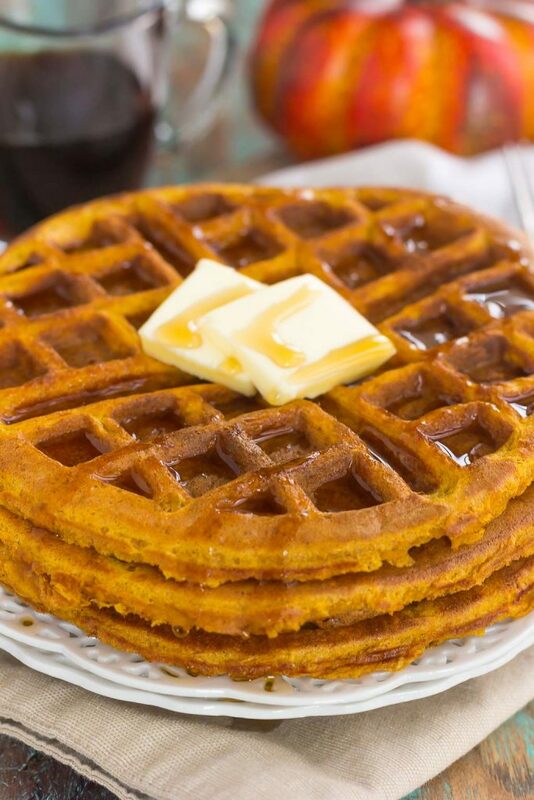 If you love pumpkin, then these Pumpkin Spice Waffles were made for you. With just the right texture and flavor, you’ll savor the sweet taste of pumpkin in every bite. And when you top these waffles with some butter and warm maple syrup, you’ve got a breakfast fit for pumpkin lovers everywhere. 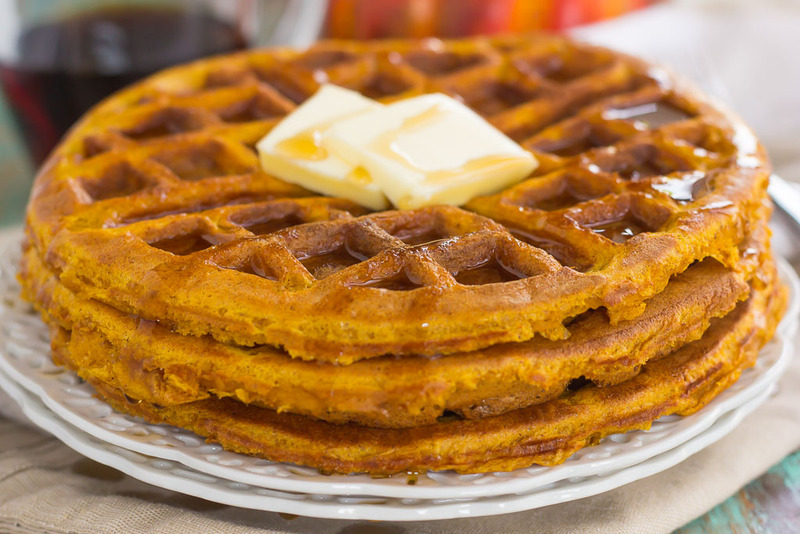 And like most of my recipes, these Pumpkin Spice Waffles are a breeze to whip up. The hardest part is making sure your waffle iron cooperates with you. So grab that pumpkin and whip up this easy and oh-so delicious breakfast today. I guarantee this is sure to be a crowd-pleaser for the pumpkin lover in your life! These Pumpkin Spice Waffles are crispy on the outside, tender on the inside, and filled with cozy fall flavors. 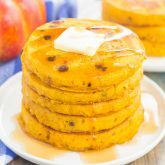 You can satisfy your craving for pumpkin with this easy breakfast that's sure to be a favorite all year long! Preheat waffle iron according to your model's directions. In a large bowl, combine the flour, baking powder, baking soda, salt, and pumpkin pie spice. Set aside. In a medium bowl, add brown sugar, pumpkin, egg yolks, yogurt, milk, and vanilla. Beat until combined with an electric hand mixer or stand mixer with fitted paddle attachment. Pour pumpkin mixture into flour mixture and beat until just combined. Set aside. In another medium bowl, beat egg whites until stiff, about 3-4 minutes. Lightly grease waffle iron with non-stick cooking spray, if needed. Add batter and cook until lightly golden brown and cooked through, roughly 3-4 minutes. Ok glad it's not just me! 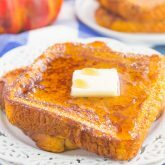 :) And your pumpkin french toast sounds delicious! Thanks for the kind words, Megan! Oh yes!! I love waffles and I love pumpkin so these need to happen for me ASAP! I have a waffle iron at home and don't use it a whole lot, but when I do I can feel your pain with the batter oozing out and the little bit of mess. I do enjoy the process though ;) I can see this for breakfast real soon with a knob of butter and lots of maple syrup, but would love to try 'em with chicken too for dinner....one of my faves! Pinned, of course. Have a great week, Gayle!! It is a fun, but messy, process! Maybe I just need more practice! :) And I love your idea about having this with chicken...yum! Thanks for the kind words and pin, Dawn! Gayle, these waffles look pretty perfect to me! and yes, hooray for PSL everything! I'm with you...which is probably why I never mind when hubby wants to get in there and make them! ;) Plus - he's just masterful when it comes to pancakes and waffles! These do look amazing, Gayle! I'd love a stack!! Sounds like your husband is the waffle pro! Thanks for the kind words, Annie! These look perfect Gayle! Love pumpkin spice everything during this time of the year! I don't make too many waffles either! Now I'm wondering why I don't have a fancy waffle maker like that! Lol. Mine is so basic, but it does the trick! I'm so scared of it overflowing that I usually get waffles with a bunch of holes in them. These would be a BIG hit here! Waffles are so hard to perfect! Thanks for the kind words, Ashley! Well dang, you have a fancy waffle maker!! Mine only has a light that tells you when it's preheated. No desired crispness meter or little batter scooper. Just ONE light. Maybe I need a new one, huh? But it's my trust waffle maker!! ;) Lol. 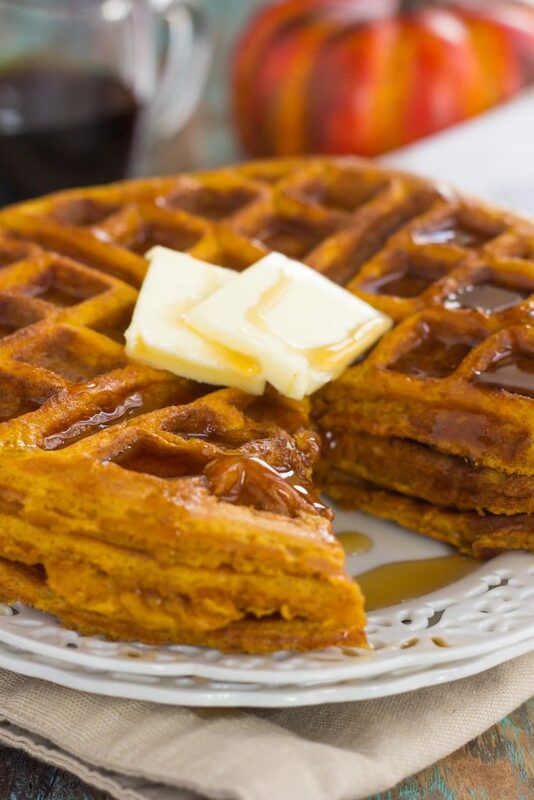 Anyways, waffles do require some patience when cooking, but I think they make the most perfect fall breakfast and these look absolutely delicious Gayle (pumpkin and all)! Seriously, I could get down with a big ole stack of these babies! Pinned of course! cheers! Haha guess mine is a little fancier, but I still screw them up! :) Thanks for the waffle love, friend! I'm so obsessed with these !!! I definitely don't have a fancy waffle maker, but it does the trick ;) I'm totally trying these soon to indulge the pumpkin spice obsession! Thanks for the waffle love, Annie! I am so excited for all the pumpkin recipes that are popping up today! I have a pumpkin waffle recipe coming up too - it's just the perfect way to use pumpkin, isn't it! Thanks for the kind words, Dannii! Pumpkin is the best! Haha no pumpkin spice french toast...yet! :) Thanks for the sweet comment and pin, friend! These look perfect, Gayle! It's been too long since I've made waffles too even though I had a huge obsession with them when we first got our waffle maker. Ours is just a basic one and I love how yours lets you select the perfect crispiness. I wish I had a stack of these cozy fall ones for breakfast this morning! These look perfect Gayle! And such a great flavor, love it! I'm not good at making waffles, need to try these for breakfast! Some might think waffles are a breakfast food, but I want these for dinner! They look wonderful, Gayle! And they're filled with all the pumpkin goodness I'm craving! Waffles for dinner are perfect! "Brinner" is one of my favorite meals. Thanks, Amanda! haha oh gosh I have such a tendency to over-pour batter in the waffle maker! And then it oozes all over and makes such a huge mess! The pits! 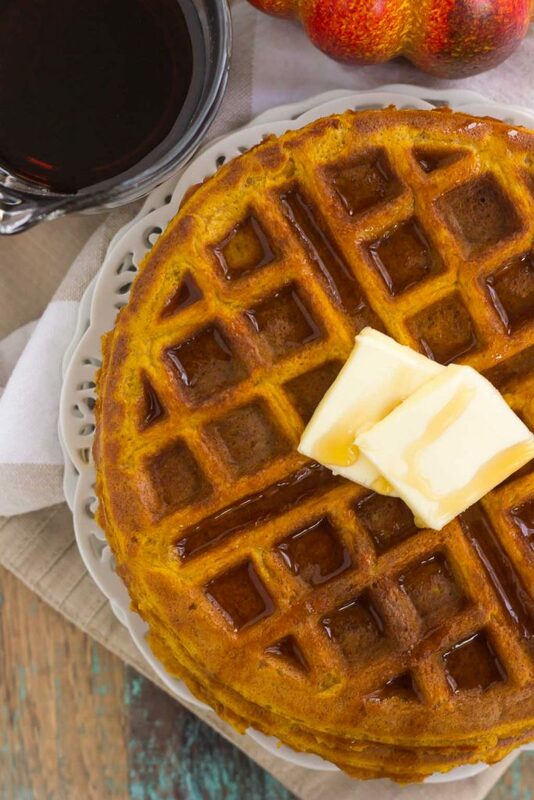 But these waffles sound fantastic - so perfect for fall! Glad I'm not the only one! Thanks, Ashley! It's okay...I always overflow my waffle iron, too! :) These sound incredible -- and well worth the effort of pulling out that extra appliance! Ok phew! :) Thanks, Blair! Oh how I would love to start my mornings with this beauty! It's just perfect. 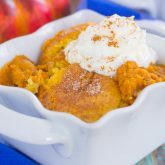 These look so fluffy and delicious, Gayle, and I love that you packed these full of a whole can of pumpkin AND Greek yogurt! I love making waffles so much more than pancakes because I hate flipping, even though the batter does often overflow. haha These look like the perfect fall breakfast! That is one fancy pants waffle iron, girlfriend! 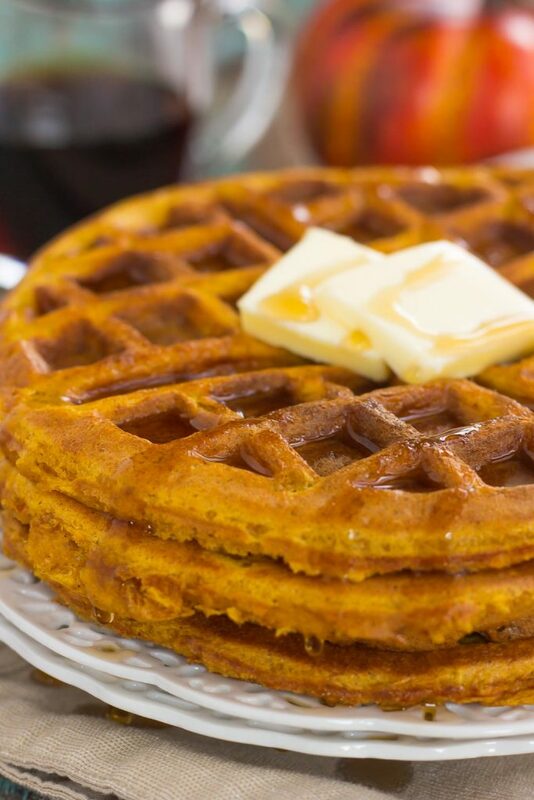 You sure put it to good use to make these pumpkin waffles! Pinned! Thanks for the waffle love and pin, Rachelle! It's so hard to be patient with food! :) Thanks, Medha! Oh gosh, PUMPKIN waffles?? Why have I never made these and more importantly, why are these not my breakfast right now?? Seriously, these look BEYOND amazing, Gayle! I want to dig into that perfect stack nooooow. Thank you, Sarah! I'm hooked on pumpkin waffles! Why don't I ever make waffles? I love them so much more than pancakes. These look fabulous! I struggle to get waffles just right, too! I need to try these soon! LOL - you're really living up to your blog's title today! And in delicious form. I am craving those tender, flavorful waffles! I absolutely LOVE waffles! I have an old hand-me-down waffle iron from my grandparents, and it doesn't have a light or anything. Total trial and error for the first few waffles, I feel your pain ;) These look amazing! Yes! Trial and error definitely sums it up for me, too. Thanks, Denise!